14-karat gold Victorian en esclavage-style necklace circa 1850, with diamonds, turquoise enamel, star, moon, and serpent motifs. 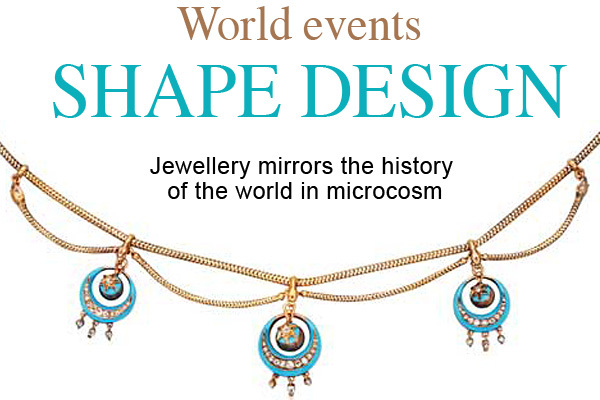 Jewellery designs over the past few centuries have been influenced by myriad events‚Äîsome international, some local. Changes in politics and diplomacy, the drama of natural phenomena, exploration, and archeological discoveries have all been contributing factors. Before the Internet, television, and mass transportation, designers, manufacturers, and the jewellery-buying public often relied on various international expositions for information and inspiration. These much-anticipated events combined museum, art gallery, encyclopedia, and workbook manual, all designed to showcase the exotic, as well as the skilled innovators of the time. This yearning for the unusual merged with a fascination for the romanticized natural world away from the grime and dirt of bustling cities and towns. 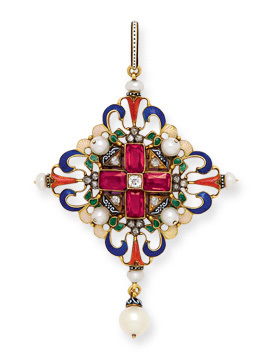 18-karat gold Renaissance Revival lozenge-shaped gem-set pendant with garnets, pearls, rose-cut diamonds, polychrome enamel, and pearl drop. By Carlo Giuliano, circa 1880. 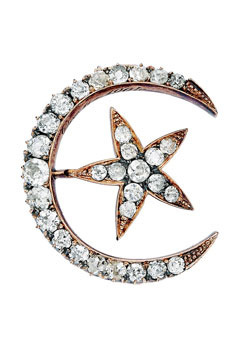 14-karat gold crescent moon and star brooch, with old mind- and old European-cut diamonds. Circa 1900. The Great Exhibition‚Äîthe first international World’s Fair‚Äîwas held in London at the Crystal Palace in 1851. Credit goes to Prince Albert for the idea of highlighting achievements in design arts, architecture, archeological exploration, and industry from around the known world. Technological innovations and the most fabulous stuff imaginable were on display alongside treasures, such as a few bits owned by Queen Victoria, including the largest known diamond at the time‚Äîthe Koh-i-Noor‚Äîthen weighing 186 carats. A 50-kg lump of gold from Chile was on show, as were rubies, sapphires, and pearls from India, as well as Swiss pocket watches. If jewellery wasn’t your thing, you could meander along to the next aisle to view the latest in kitchen appliances, farm equipment, and guns. The venue provided a cross-cultural space to indulge in bragging rights, a bit of showing off, and national pride. Inspiration gleaned from the exhibits highlighting the ancient civilizations of Rome and Greece filtered through to the design of jewellery and had broad and far-reaching influences on popular design motifs for decades. At the time, astronomy was considered a suitable interest for a proper gentleman and the recurrence of Halley’s Comet approximately every 75 years inspired jewellery with celestial themes. Often a brooch’s main stone would have a diamond, amethyst, or garnet representing the comet, with a decorative tail of graduated similar stones, sometimes with an elongated flare of gold. Crescent moon and star motifs decorated brooches and en esclavage necklaces, often with seed pearl and enamel accents. Sunbursts and starbursts were also popular. The expositions held in Paris in 1889 and 1900 continued the fascination with the natural world post-Darwin, and amateur hobbyists appreciated motifs with butterflies, dragonflies, and even the romanticized version of bats and snakes. Brooches, in particular, were designed with pliqu√©-√†-jour enamel in rich colours. Curves, swirls, and coiling tendrils were common components. blossoms, and animal deities. Mounted in silver and 14-karat gold, circa 1920. ‘Revival’ was a broad umbrella term that covered a whole range of designs inspired by the discovery of burial tombs near Rome in the 1820s and ’30s. Archeological Revival was key at another international exhibit in London in 1862. The Castellani family was famous for its mastery of Etruscan Revival granulation; tiny beads of applied gold make up the decorative patterns of corded wirework and filigree scrolls. ‘Boss’ surmounts of circular discs accented brooches, drop earrings, and wide-hinged bangle bracelets in 18-karat yellow gold or higher, reaching peak popularity in the 1860s and ’70s. In modern times, Ilias Lalaounis may have been inspired by these iconic designs. The Castellani family perfected the art of micromosaic tile designs using tiny glass pieces called tesserae. The different colours fitted together like a miniature jigsaw puzzle to create the intricate vibrant picture. Popular motifs included doves, beetles, flowers in urns, amphorae, and the ‘Veduti di Roma’ series with scenes depicting ancient architecture like the Colosseum. Amazingly, many of these drop earrings, brooches, and bracelets still exist with little or no damage or loss to the tesserae. The fixation for all things Egyptian begins in the late 1800s and intensifies with the opening of the tombs in 1922. A fabulous example of Egyptian Revival is a bracelet decorated with carved hard stone scarabs, palms, and animal deities in shadings of palest to deeper greens, the reverse with incised hieroglyphics and set in silver and gold. Cartier revisits the idea in the 1980s with a simpler, contemporary version of a scarab ring in 18-karat white and yellow gold. Carlo Giuliano’s enamel work is synonymous with Renaissance Revival in the 1880s. One example is a lozenge-shaped pendant set with garnets, pearls, and rose-cut diamonds, highlighted with polychrome enamels in blue, orange, green, black, and white; a natural pearl drop completes the piece. A great sample of Gothic Revival is a diamond-encrusted brooch of an ornate capital letter, ‘J,’ circa 1890. Japanese decorative arts were formerly closed to the West, but displayed during the London International Exhibition in 1862. Still inspiring jewellers well into the 1920s, the Japonesque designs leaned toward the usual picturesque stereotypes of mountains, lakes, and boats‚Äîattractive nonetheless. Tiffany originated many pieces with Oriental inspiration. Over time, what once was considered strangely odd and excitingly exotic has come to be classically familiar, but no less enticing. The progression from style to style happened due to diverse influences; combing jewellery archives is like watching the history of the world in microcosm‚Äîboth informative and alluring.